The RMC Reliant Document Library is a library containing all sorts of documents from Reliant’s history. Many are not to do with the vehicles themselves but the day to day running of Reliant whether it be notices or letters to customers, dealers or employees to News items and Press Releases. As with all the document sections within this website, we will continue to add documents to this library as they are scanned. if you have any Reliant documents (either scans or hard copies) not detailed on this page then please click here. We are especially interested in any old Reliant letters to employees. Route of Royal visit through Welding, Soft Trim, Paint & Assembly Robin and Scimitar. 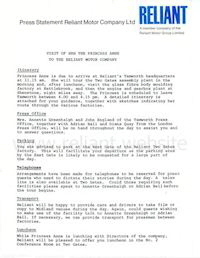 Route of Royal visit through Mould making, Scimitar moulding, Robin mouding, Press moulding. R. Wiggin writing to E.S.Thompson oin Israel. Recall of Robin during to steering bracket issue. A 1960s caricature of Reliant by Norman Edwards in he 1960s. Unknown Reliant route to Warwick Castle in 1975. Hutson Motor Co. Ltd. West Yorkshire. Kitten’s 60 mpg economy will make drivers purr.